Yay! I've been tagged in a meme! It's like being at school and getting called up to join in with a netball team (or similar) when being tagged in a meme. You feel all *included*. Joy. I've been tagged by the lovely Karis from What a difference a day makes. The idea is very simple. 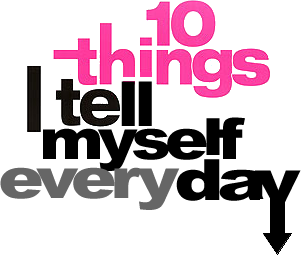 I have to tell you 10 things I tell myself every day, and then tag a few more bloggers so they can share the same. Let's get on with it shall we!! 1) Ahh, hello 7am.. Only 12 hours 'til bedtime.. start the countdown clock! 2) It's OK.. It'll be Thursday soon, Grandma and Grandad will take over for a few hours then and I can have a break (if it's Thursday then I just think Thank God it's Thursday!). 4) What the Hell am I going to cook tonight? I CAN'T BE FARKED WITH THAT! 5) I'm not going to eat chocolate or cake today. 6) I'm not going to drink coffee today. 7) Damn.. I've just eaten a whole bag of mini eggs and drunk a vat of coffee. Felt good though! 8) I wonder if I can manage not to go into a supermarket today.... (the answer is always.... NO!). 10) I am perfectly normal.. the way I feel is not unusual.. It won't be like this forever! Ah.. that was easier than I thought it'd be actually! Rather like Karis, I thought it'd be harder than that, but I could have kept going! You don't have to join in lovelies, but if you do, let me know! You do better than me then!! I do them when I go to an exercise class, but I always have this idea that I'll just do 100 or something whilst Ethan is watching TV... never happens! Oh good! I'm glad that's ok.. I should've asked really, not just pinched it! Magpie Monday - Clothes for the future..
A Massive Medicated Thank you! Trendy Toddler Tuesday - Yes Chef! Trendy Toddler Tuesday - I'm so cool! #Sun Fun - A conversation about food. They f**k you up, your parents do..